2/ In the Search box at the bottom of the Start menu type: task scheduler. 3/ The Task Scheduler option will appear highlighted at the top of the search list. Press Enter to launch Task Scheduler. 4/ If the User Control Account (UAC) window appears. If you are the administrator then just Click the Continue button. If you are not the administrator then you will need to obtain the administrator user name and password before you can continue. 5/ The Task Scheduler window will now open. 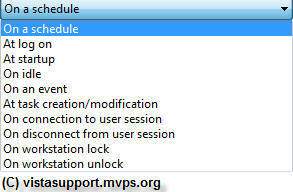 6/ In the Left hand pane of the Task Scheduler Window, Click on the > arrow next to the Task Scheduler Library. This will expand the option list. 7/ Next Click the > arrow next to the Microsoft option. Again the list will expand. 8/ Next Click the > arrow next to the Windowsoption. Again the list will expand. 9/ Scroll down the list of Windows options until you see System Restore. Now click on this option. 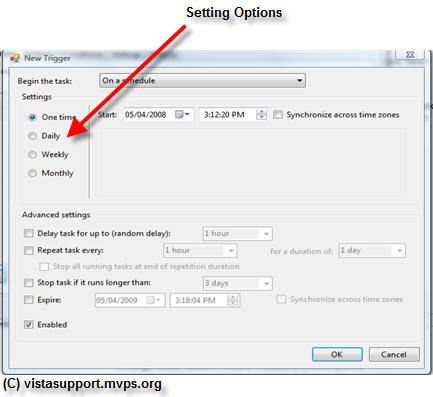 10/ The System restore option will open in the Middle pane of the Task Scheduler. 11/ In the System restore options window, Click the Trigger tab. 12/ In the Trigger Tab window you will see one or more entries. 13/ Now look in the Right Hand pane of the Scheduler window and Click Properties. 14/ In the SR Properties Window, Click the Trigger tab. 15/ At the bottom of the Windows you will see a button marked New. 16/ Click the New button. 17/ In the New Trigger Window you will see, at the top, a section marked Begin the task. Alongside this section you will see a box which say's On a schedule. 18/ Click the Arrow on the Right Hand side of this box to expand the menu (see Fig: 1). 19/ You can now select, if you wish, an option from here. 20/ If none of these options fit then simply leave the On a schedule option as default and move down to the section marked Settings. 21/ From here you can set the date and time you want the restore point to be created. You can set this to be One time; Daily; Weekly or Monthly. 22/ Once you are satisfied with your alterations, Click the OK button followed by OK again on the next screen to close the task scheduler. 23/ System restore should now create a restore point when you want it to.